Stuart Gordon helms an enjoyable if somewhat shallow sci-fi film with classic stop-motion animation. MGM US R1 DVD. 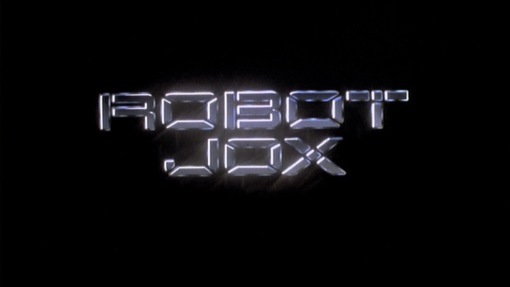 Although an American production, Robot Jox has a distinctly Japanese flavour to it throughout and is instantly remniscent of an Animé cartoon. The focus of the storyline is obviously the neo-Gladiatorial combat which certainly provides for some highly enjoyable set pieces, although the script never really explains how and why this robot combat has become so key, leaving it all feeling rather contrived - if nothing else, in countries beset by the aftermath of a nuclear war, expending huge amounts of money on giant robots would seem rather wasteful - the idea that the robots are controlled with gestures from the inside is perhaps the ultimate evolution of the Wii console but again comes off as a completely unnecessary invention. At the same time, the world outside of the battle zone is almost completely ignored, we know it is post-apocalyptic with seemingly only two countries remaining, but we find out nothing more - the Confederation in particular are obviously based on Communist Russia and we are supposed to see them as the villains (aided of course by the choice of their name, harking back to the American Civil War) but given no reason to do so apart from the unpleasant attitude of their robot fighter. As an interesting aside, although written in the late 1980s during the Cold War, production problems meant that the film did not emerge until 1990 when the Berlin Wall had fallen, doubtlessly leaving these characters seeming very outdated even on the film's initial release. The Market, based on America, are obviously intended as the heros, but the script pops up with some surprisingly quasi-Fascist overtones in the Market's attitudes with encouraged and rewarded breeding programmes and black suited armed guards, although unlike Paul Verhoven's Starship Troopers (1997) this does not seem to be intentional satire. The whole idea of genetic modification that plays a key role in the storyline is similarly undeveloped. We are lead to believe that the group of students have been trained from birth to be unemotive fighters, living only to fight in the robots, yet they seem rather sub-par in comparison to Achillies and when Athena gets into the robot, she seems completely unsure what to do, needing continual instructions on how to fight in the mech. With neither the background to the robot wars, or the background to the society being explored, we are left with a plot that would function equally as well in any boxing or sports movie script and is not particularly original, with the cliché theme of an old fighter wanting to retire but being forced to come back for one last bout. Fortunately the script is well paced and has enough action scenes to keep things moving with a neat little espionage subplot and well integrated, uncliché romance as the film builds to the anticipated showdown which is allowed more than enough screentime to develop some genuine tension. Director Stuart Gordon is best known for his subversive, gory horror Re-Animator (1985) but his direction here is pretty workmanlike, getting the job done although with little flair. The Japanese atmosphere is most pronounced in the visual style of the film, with the white colour scheme and futuristic set design of the robot labs being instantly remniscent of a Toho production or one of their clones (indeed watching it you continually expect to see a Japanese cast and dubbed voices). Robot Jox is most notable however as being one of the last major films to use stop motion special effects instead of CGI and all of the robot effects are created using this process - the lengthy fight scenes therefore will be of particular interest to stop-motion fans and they all look very impressive. Unfortunately they also seem to have used up most of the budget and so there are some crude looking blue-screen effects in a few scenes (where the robot looms over the audience stands in particular) and the sequences outside of the robot centre all look very cheaply done (they would look more at home in a straight-to-video cheapie), destroying a lot of the atmosphere. Gary Graham is fine in the lead role as Achillies, although the role never really calls on his acting ability. Anne-Marie Johnson as Athena looks rather wooden although this might be a deliberate decision for the generically modified character and it seems to suit the character well. Stuart Gordon regular Jeffrey Combs (Re-Animator's Dr. Herbert West) has a brief cameo as a citizen. With some beautiful stop motion effects, Robot Jox is an enjoyable sci-fi film, but with a more ambitious script and better funded production on the non-fighting scenes it could have been a whole lot more - indeed there is enough potential material in the setting to fuel an entire television series. Partly recommended. Anyone famous in it? No-one particularly well known. Any gore or violence? A couple of bloody shots, nothing particularly violent. Who is it for? Fans of Japanese style sci-fi will find plenty to enjoy here. Picture quality is strong throughout with good colours and detail. Bonus trailers for Final Fantasy VII, Godzilla Final Wars, Mirrormask and Steamboy. Other regions? A similarly good looking DVD from Movie Power in Germany (as Robotjox) with English and German audio, no subtitles. Cuts? Believed to be fully uncut, although the DVD case and the opening of the print contain the MPAA PG logo, the print contains some brief shots cut from the original US theatrical prints (a couple of slightly more bloody effects). The print used is English language. An enjoyable if rather unambitious sci-fi film. A great looking and sounding DVD although it is a pity the original trailer is not even included. All text in this review written by Timothy Young - 9th February 2011.